Album cover, Dedication, by Justin Kauflin. A more-than-residual sense of classicism is very much alive in Justin Kauflin's jazz playing. The close teacher-to-pupil, father-to-son-like relationship that developed between the dying, nonagenarian trumpet great Clark Terry and his last protégé, the young, gifted blind pianist Justin Kauflin, was the highly moving, emotional core of director Alan Hicks’s excellent, award-winning documentary, "Keep On Keepin’ On." For many fans, the documentary was probably the first introduction to Kauflin who, despite losing his sight at age eleven to a rare eye disease called exudative retinopathy, has overcome all odds, including even a once dark, debilitating fear of facing the fierce competition in the Thelonious Monk contest: to become a fine, lyrically inventive and thoughtful pianist. Like Terry, his inspirational, caring mentor, he knows the absolute value of the well-chosen, perfectly placed note. Thanks to Terry, a master coach and psychologist who led him out of the slough of despond and self-doubt, Kauflin faced down his performance fears, showed up for the Monk competition and, quite creditably, was a semi-finalist in the once dreaded, high-noon showdown. In a tribute to Terry and other significant mentors (including the late Mulgrew Miller), friends and loved ones (especially his mom) who have helped him along his journey through both trials and triumphs, Kauflin has crafted an excellent album called Dedication (Jazz Village). As part of the ongoing celebration of his acclaimed CD, he’ll tap into its selections with his trio on Saturday, September 12, at 8:30 pm at Old Lyme’s Side Door Jazz Club. What you get on Kauflin’s Quincy Jones-produced album are 12 well-crafted originals, including seven dedications, served in an alternating mix of trio and quartet formats. Each track showcases Kauflin’s fluent playing, consummate musicianship, pristine touch, sense of form and content, well-tempered with good taste. On the trio tracks, he’s accompanied by two longtime, simpatico sidekicks, bassist Christopher Smith and drummer Billy Williams, the same lineup he’ll lead at The Side Door. On the CD’s quartet pieces, the fourth voice is provided by guitarist Matt Stevens who co-mingles a Pat Metheny-like, impressionist aura with Kauflin’s already deep pool of liquid lyricism. On unison passages, Kauflin’s piano and Stevens’ blue guitar generate a ringing resonance echoing with a George Shearing-like coolness and precision. On the gospel-styled grand finale called "Thank You Lord," Etan Haziza’s nylon string guitar brings an almost harp-like, celestial ambience to the spiritual piece. It’s just one of many signs of variety that run throughout Dedication’s 12 selections, which stride from sanctified reflections to swingers like the up-tempo "Up and Up." Young Kauflin lost his sight, but never his resilience. Born in 1986 in Virginia Beach, Virginia, Kauflin, a child protégé, was by age six playing the wedding and nursing home circuit, eventually acting as a precocious concertmaster for several orchestras. 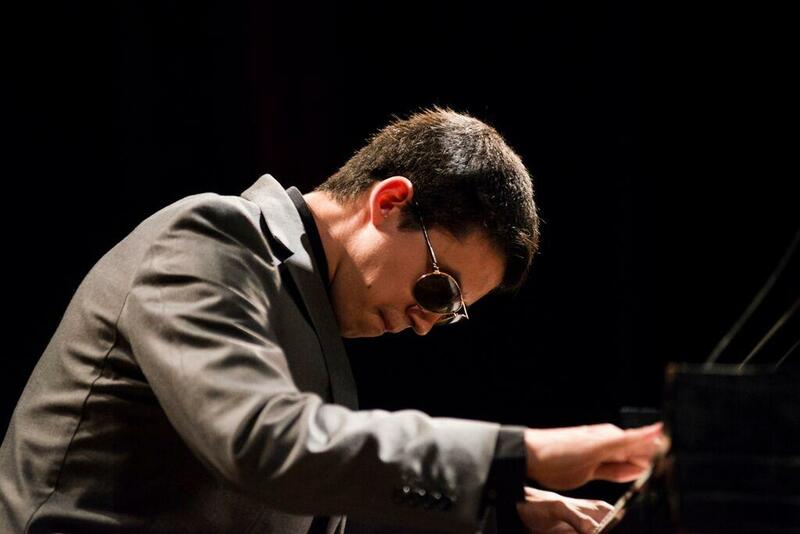 Before losing his sight, he loved reading, sports and classical violin and piano, which he studied for nine years before converting to jazz piano at 15. A more than residual sense of classicism is very much alive in his jazz playing as, for example, on his solo piano homage to his mother, "Mother’s Song." It sounds almost as if a great classical pianist, say John Ogdon, might have casually sat down at a concert grand to improvise themes and variations evolving into an evocative mood piece. Despite many tense trips in his childhood with his mother from Virginia to Baltimore for eye surgeries at Johns Hopkins Hospital, young Kauflin lost his sight, but never his resilience. This is embodied not only by his musical artistry, but also by his ability to triumph over every single challenge in daily life, even mastering the daunting complexity of New York’s subway system, which he navigates as readily as he does the chord changes to "I Got Rhythm." Not only can he play "Take the A-Train," but he can also, quite readily, take it as well. Information: thesidedoorjazz.com and (860) 434-0886. 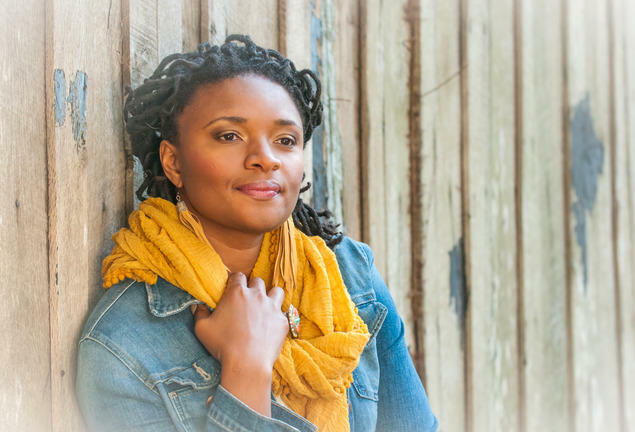 Whatever genre singer/songwriter Lizz Wright might chose to work with —whether it’s jazz, R&B, pop, blues, gospel, soul, funk or any exotic hybrid mix—the constant mesmerizing factor is her lush, gorgeous voice whose dramatic, expressive range is as much at home with the sensuous as with the spiritual. Celebrating the release of her new album, Freedom and Surrender, the 35-year-old diva, who was initially hailed as the next great jazz singer of her generation, performs on Sunday, September 13, at 7:30 pm at Hartford’s Infinity Hall at 32 Front Street. On her soul-searching release -- her first recording for Concord Records -- the songs, which are mostly originals along with a couple first-rate covers, flow with a straight-forward clarity, sometimes slinking in silken, sultry moods as in her amorous ballad duet with singer Gregory Porter on "Right Where You Are." Her cover of the Bee Gees’s "To Love Somebody" absolutely sizzles with soul-searing passion. On Freedom and Surrender, which marks the next giant step in her artistic journey, her direction is high pop, inflected with eclectic influences, all done with top studio production values. It’s a showcase for both her singing and songwriting, while simultaneously serving as a musical memoir and personal expression of being true to herself, living up to her own open-ended, personal expectations rather than those of critics who wish she would stick with jazz, blues, and gospel. Life and art converged for Wright in a near-death experience when her car slid across 300 yards of ice-coated mountain curve. “I softened my body and rested my hands in my lap. The heavy car floated silently towards a 75-foot ravine that ended with a wide band of frozen creek,” she recalled. “I was stopped by a young Bellwood tree that grew out of the bank like a hook. I slowed my breathing and meditated in suspension. About 20 minutes later, a young neighbor pulled the door open, reaching in with a strong arm to guide my climb out,” she said of the lifesaving rescue from troubled waters. As a memento of the tree as savior, she noted that the Bellwood’s pink bells are displayed on her homepage. “I want to keep such simple things close from now on. Why not? They were strong enough to save me. In surrender I experience freedom” she said, mirroring the title, Freedom and Surrender, and the individual songs "Freedom" and "Surrender," which bookend her CD’s beginning and ending. Tickets: $34.00 to $54.00. Information: infinityhall.com and (866) 666-6306. 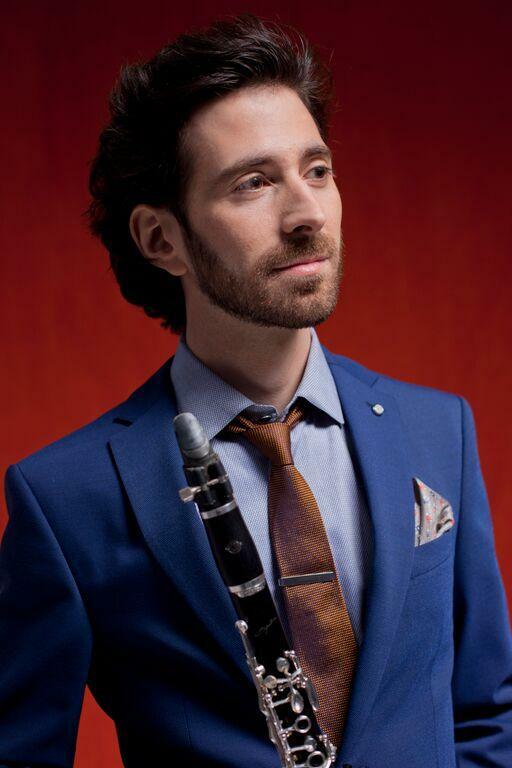 Oran Etkin, the internationally celebrated, Israeli-American bandleader/composer and clarinetist, presents his highly original, well-crafted and loving tribute to Benny Goodman in performance on Sunday, September 13, at 1:00 pm at the Ridgefield Playhouse in Ridgefield, Connecticut. Playing selections from his new, recorded homage to The King of Swing, What’s New? Reimagining Benny Goodman (Motema Music), Etkin employs the same instrumentation as the classic Goodman Quartet with his own all-star lineup featuring the rising, young pianist Sullivan Fortner, the noted vibraphonist Steve Nelson and drummer Matt Wilson, a percussionist at home with any era from 1930s swing to 21st century avant-garde. Don’t look for anything at all like a Smithsonian-style, note-for-note recreation of masterworks from the Goodman Quartet, which famously featured Benny on clarinet, Teddy Wilson on piano, Lionel Hampton, vibes; and Gene Krupa, drums. Instead, expect imaginative tributes through Etkin’s creative takes, or “reimaginings” as the CD title promises. For example, the album opens with an Etkin original called "Prelude," which he created by using fragments of motifs from Bach and from Goodman’s version of Louis Prima’s "Sing Sing Sing," which was a dramatic showstopper at Goodman’s historic 1938 Carnegie Hall concert. Etkin’s two inspirations for his tribute were Goodman’s groundbreaking concert at the Palomar Ballroom in Los Angeles in 1935 -- regarded as a powerful catalyst for the Swing Era -- as well as the iconic bandleader’s role in breaking down the infamous color barrier of the period. Only a few months after the Palomar concert, Goodman, in a gesture of courage and social conscience, hired Wilson, an African-American, to join him and Krupa in forming America’s first mainstream, racially integrated band. To put this in historical context, Wilson jumped the color line 12 years before the great Jackie Robinson broke Major League Baseball’s apartheid policy in 1947. Soon after Wilson was aboard, the trio was expanded to a quartet with the addition of Lionel Hampton, yet another brilliant African-American joining the Swing King’s regal quartet, which would make some of the finest chamber jazz music of the Swing Era. Inspired by Goodman’s contribution to the struggle for equality, Etkin composed "When Every Voice Shall Sing," and dedicated the album itself to Goodman’s superb trio and quartet, integrated combos whose very existence, much less their triumphant excellence, was a blow against racism. The concert is preceded by brunch in the lobby at noon. Admission: $35.00, adults; $25.00, students. Information: ridgefieldplayhouse.org and (203) 438-5795. Maurice D. Robertson, host of WWUH-FM’s "Accent on Creative Music" and an acclaimed photographer who captures the beauty and spirit of the moment, will present selections of his jazz photography work as part of the al fresco festivities at Connecticut Landmarks’ free Sunset Sounds Concert Series on Thursday, September 10, at the historic Butler-McCook House and Garden at 396 Main Street in Hartford. A combination of art and music, the garden gala, which runs from 5:30 to 7:30 pm, also includes a performance by saxophonist Richard McGhee III and the Rahstet, a Hartford-based sextet featuring vocalist Margaux Hayes. Music starts at 6:00 p.m. Concert-goers are urged to bring a picnic dinner to enjoy as they savor the jazz images and live music in the splendid garden oasis on Main Street. Celebrating its 150th anniversary, the restored Victorian ornamental garden and horticultural delight was originally laid out by landscape pioneer Jacob Weidenmann whose major Hartford projects included, among others, the designs for Bushnell Park and Cedar Hill Cemetery. Information on the event: (860) 247-8996, extension 14. Robertson, a jazz savant and hands-on activist on behalf of the music, will make a special presentation of his jazz-inspired photography, one of a number of themes he embraces with his wide-ranging camera artistry. His vibrant photos celebrate the existential elements of live jazz performances, capturing the dynamism of the performers and the electricity of ideas generated in the moment. 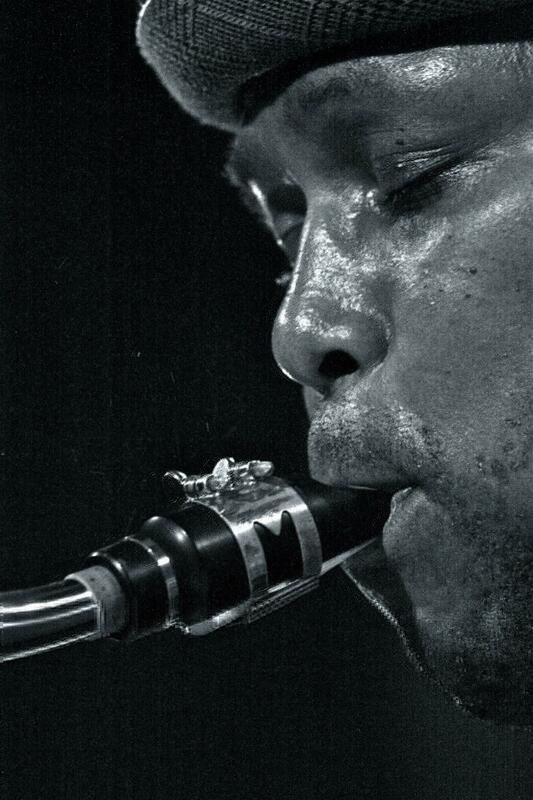 In a tight, close-up portrait of saxophonist JD Allen’s face, for example, Robertson’s vivid black-and-white image portrays the dramatic intensity and physicality of the improvising artist at work, an image that virtually takes you inside the creative process, true grit and all. Besides his striking individual portraits, Robertson’s group shots of musicians in action also crackle with atmospheric and aesthetic energies. A typical example is a classic, heat-of-the-moment image of the kinetic forces connecting drummer Curtis Torian, bassist Dezron Douglas and saxophonist Lummie Spann at what seems like a sudden, bolt-like, shared revelation on the bandstand. A fleeting jazz epiphany, it’s forever preserved here in black-and-white. Robertson will show 10 to 12 of his photos, mostly new works along with some older standard bearers that focus on such icons as Miles Davis and Dizzy Gillespie. Photos are for sale at $300 each. His works will be exhibited from September 10 to October 5 in the Aetna Gallery at the Butler-McCook House. Gallery admission: free. Hours: Thursday through Sunday, noon to 4:00 pm. For information on Connecticut Landmarks: ctlandmarks.org. More than a half-century ago, a small, devout band of jazz-loving members of a then obscure, but courageous group called The Hartford Jazz Society launched HJS’s first riverboat jazz cruise on the Connecticut River. Renowned region-wide since 2007 for its abundant servings of savory, red-hot Latin sounds and friendly, festive communal vibe, the free, outdoor Ray Gonzalez Latin Jazz and Salsa Festival presents its annual sizzling summer celebration in downtown Hartford on Saturday, August 29, from 5:00 to 10:00 pm at Mortensen Riverfront Plaza. Just as she’s fluent and elegantly at ease in both Portuguese and English, the rising, young Brazilian-born, singer/songwriter and pianist Isabella Mendes is also much at home with her seemingly contradictory dual careers in music and engineering. If Cuban pianist Chuchito Valdes is intimidated by the burden of being the heir apparent to his family’s dynasty of world-renowned keyboard kingpins, you’d never know it from his regal virtuosity and royal touch and tone crowned by a majestic expressiveness that can hurl sonic thunderbolts and release endless torrents of joy.